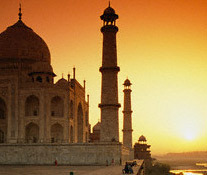 The Rajasthan and Taj Mahal Tour offer glimpses to Indian richness, royalty and grandeur. Beginning from Delhi, the journey moves westward towards Mandawa, the land of beautiful havelis, mansions and royal castle. The next halt is in spicy desert city - Bikaner, known for its vast expanse of deserts. The journey proceeds further to the blue city called Jodhpur which also has beautiful deserts. Next famous halt is in the ultimate destination in Rajasthan, Udaipur. Through the heritage of Deogarh, the tour moves towards the heritage of Jaipur and Ranthambhore. 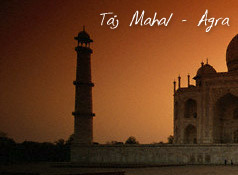 Then, the journey reaches at Agra where Taj Mahal basks in glory and magnificence. The tour graduates with Delhi�s sightseeing including Raj Ghat (Cremation site of Mahatma Gandhi), Red Fort, Jama Masjid, Qutub Minar & India Gate (War Memorial). Drive Past President House & Parliament House. Arrive in Delhi. Meet and assist at the airport. Then transfer to the hotel. Overnight stay at the hotel. After breakfast, drive to Mandawa, 242 kms and 05 hrs drive. Upon arrival transfer to the hotel. Rest of the day is free for leisure. Overnight stay at the hotel. After breakfast, proceed for sight seeing for Mandawa, Mandawa Castle is one of the finest castle of Rajasthan, is now a beautiful hotel and it has beautiful frescoes, Havelis & mansions. Overnight at hotel. Morning breakfast, proceed for Bikaner, 164 kms and 03 hrs drive. Upon arrival transfer to the hotel. Afternoon city tour. Bikaner City is bolstered by imposing walls and has a 16th century fort, housing old palaces, temples and mosque. Founded by Raja Rai Singh, the fort is distinguished by its long range of 37 pavilions, a line of balconies and aerial windows of varying designs. Also visit Lallgarh Palace, the museum, Bhanda Sagar Jain and Deshnoke Rat Temple. Overnight at hotel. Morning, drive to Jodhpur, 243 kms and 05 hrs drive. On arrival check in hotel. Later proceed for an afternoon city sightseeing. Jodhpur, stronghold of the fierce Rathore clan was founded in 1459 by Prince Jodha. Visit the Mehrangarh Fort situated on a low sandstone hill. Within the fort visit Moti- Mahal and Phool Mahal. Also visit Jaswant Thada, an imposing marble cenotaph built in memory of Maharaja Jaswant Singh in 1899 and the Umaid Public Gardens. Also visit the Mandore Garden and Clock Tower. Overnight at hotel. After breakfast, drive to Udaipur, 275 kms and 06 hrs and enroute visit to Ranakpur Temples. Upon arrival, check in hotel. Afternoon sightseeing of Udaipur. Visit the city palace, Jagdish Temple, drive around Fatehsagar Lake, Shaelion Ki Bari (queen's resort for her friends) and Bhartiya Lok Kala Mandir (folk art museum). Rest the day at leisure. Overnight at hotel. Morning, drive to Deogarh, 143 kms and 03 hrs. Arrive Deogarh and check in hotel. The Deogarh Castle is located on a hillock and is encircled by the town. It was built in 1670 ad by Rawat Dwarkadas Ji of the Chundawat clan of the Siaodia Dynasty. Constructed by the famed Sompura architects, well-known for their additions and alterations. There are five floors and over 200 rooms have murals done by local painters after whom Deogarh school of painting has acquired fame the world over. The family has a large collection of Deogarh miniatures. Overnight at hotel. Morning, drive to Jaipur, 50 kms and 01 hrs drive. Rajasthan's beautiful Pink City Jaipur, was the stronghold of a clan of rulers whose three hill forts and series of palaces in the city are important attractions. Known as the Pink City because of the colour of the stone used exclusively in the walled city, Jaipur's bazaars sell embroidered leather shoes, blue pottery, tie and dye scarves and other exotic wares. Western Rajasthan itself forms a convenient circuit, in the heart of the Thar desert which has shaped its history, lifestyles and architecture. Upon arrival, check in hotel. Rest of the day is free for leisure. Overnight at hotel. After breakfast visit to Amber Fort - Amber Fort was the ancient capital of the State. Elephant ride - Jeep Safari is provided to ascend hill on top of which the fort is situated. Afternoon city tour of Jaipur visiting the Hawa Mahal - the palace of winds, the Observatory or the Jantar Mantar. Overnight in Jaipur. Morning, drive to Ranthambhore, 145 kms and 03 hrs drive. Ranthambore occupies a pride of place among the wildlife destinations of India. A travel to Ranthambore National Park is an absolute must for the tourist having a penchant for wildlife. Best Indian Travel offers Ranthambore travel to see the wildlife at its best. Arrive Ranthambhore National Park. Check in hotel. Overnight at hotel. Morning, visit Ranthambhore (world famous wild life sanctuary). Back to hotel and afternoon drive to Agra, 227 kms and 05 hrs drive. Enroute visit to the Fatehpur Sikri. Arrive & check in hotel. Overnight at hotel. Day at leisure and departure to the international airport to depart for onward destination.